Air-fried potatoes with a bit of Moroccan spice. This week’s Sunday Supper is all about root vegetables. What’s your favorite? Mine is very typical. I love potatoes. Especially crispy ones. And this recipe is one I developed some years back as an oven-fried potato recipe, just to use up some extra harissa I had sitting around in a can. But having not too long ago finally bought an air-fryer (I got the Actifry) I decided to adapt the recipe for that. It uses very little oil- I have successfully made crisp potatoes with just a teaspoonful, which was great for weight watchers. I think they recommend a tablespoonful, but. Whatever. It gets crisp and does not stick. If you don’t have an actifry, you can still make this by tossing your potatoes with a little oil and baking them until they crisp up, turning once or twice to brown all sides. It works about the same, if not a little higher in the fats, nutritionally. But I hope you enjoy. This is good to have with just about anything Greek, Moroccan or Middle Eastern. And be sure to scroll down and see what other root vegetable recipes the Sunday Supper TasteMakers have been making this week. 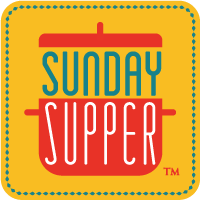 And if you blog and would like to join, just pop on over to the website or join in to Sunday Supper on FaceBook, which has a lively group. We don’t bite. At least not hard. I’d love it if you joined in time to make a recipe for the Meatball event I am hosting with SSM next week. What kind of meatballs are your favorites? Or more succinctly put: are there actually ANY meatballs you do not like? So blogging with us or not, be sure to join in and check out the huge selection of recipes that are on their way. Place diced potatoes into actifry and drizzle with salt, pepper and half the oil. Cook potatoes in actifry for 40 minutes, or until browned and crispy. Stir harissa with remaining oil, and lemon zest; toss with potatoes. Sprinkle potatoes with sesame seeds before serving. This looks amazing Sue! I bet it tastes just as amazing as it looks! I like how crisp the potatoes get in the actifry. That part does amaze me! Ok, that does it! I keep hearing wonderful things about harissa and I would love to try this recipe. It’s going on the grocery list! I think you’ll like it! It has the texture of tomato paste, but very spicy! Lots of ideas and uses for it. This looks like a delicious and easy weekday side dish! Thanks! Harissa is great at adding flavor without too much effort. Yum! Thanks Caroline! It goes well with the lemon and sesame components. I never used an air fryer but looking at your potatoes I think I need one! Perfectly cooked! Thanks Cindy! I am very happy I got one! Did you know you can make home fries in it with 1 tsp oil? And cut up corn tortillas make crispy slightly curled (not flat like baked one) tortilla chips in about 20 minutes? Pass the bowl please! These sound wonderful! I think my family would agree that potatoes are their favorite root veggie! And I’m loving your spice up spuds! The first time I had Harissa was in Disney world at the Moroccan plaza and I realized it was a taste I love! I can’t wait to try these potatoes! I’m so intrigued by air fryers, wish they werent so expensive! We bought a reconditioned one through Groupon for much less and it works great. The price put me off too, was glad I could snag a bargain! “Fried” foods on a diet? Can’t go wrong there! I’ve never had harissa before, I’ll have to give it a try. The air fryers are amazing and make the potatoes crispy. We like them a lot! What a taste! This recipe is very delicious, thank you Sue Lau!